Marcelo Ávila de Oliveira is an electronics engineer who develops software for mobile phones in Brazil. 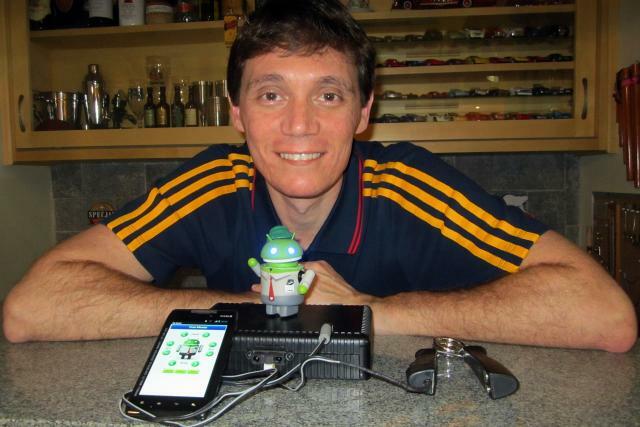 Recently Marcelo decided to use an Arduino board and App Inventor to automate an Android vinyl action figure. This "DroidBot" Android Robot is driven by Arduino components and controlled over BlueTooth by a mobile phone app developed with App Inventor. Click the Play button to view a charming video of the DroidBot responding to commands from the phone, set to the music "I Can Read Your Mind." I had a lot of fun and the final result was really cool but something was bothering me: the remote control. It was difficult to remember the functionality of all the remote control keys, and I always needed to point the remote control directly at the robot and the most important problem: it was impossible to receive feedback/data from the robot. Then I resolved to "retire" the remote control and use an Android application running on a smartphone to control the robot. In 2011 I had already used the Google App Inventor to create an Android application ("Endless Speech", an automatic aleatory speech generator, available on Google Play) so I decided that it was a great opportunity to check the "new" MIT App Inventor. I Initially thought App Inventor would not be able to control the robot but when I checked the Bluetooth features I was really surprised. I was able to successfully send Bluetooth data from the robot to the phone and vice-versa pretty easily. People of all ages love the robot. I received a lot of compliments and when I took the little guy to the work my co-workers and I had a lot of fun. Android application development using MIT App Inventor is really a piece of cake.